Process the first 5 ingredients in a small processor until relatively smooth. Heat this glaze in a small sauce pan on medium until it just starts to bubble (this happens quickly, keep an eye on it). Take off the heat and pour about 1/4 cup of the glaze into s small bowl so it can cool a little. Stir the butter into the rest of the glaze still in the sauce pan and set aside to cool. Preheat oven to 425, or you can do these on the grill*. For either, apply cooking spray to the pan (foil or regular sheet) or you can use parchment paper in a sheet pan. Salt and pepper each fillet, then brush both sides with the reserved 1/4 cup of reserved glaze (without the butter). Place skinned side up in the pan. Bake/broil/grill the salmon for about 6 to 8 minutes until it’s going golden brown. Flip each fillet over (tongs are helpful) and spoon some of the reserved buttered glaze on top. Cook until the interior of the salmon is just translucent, a spare few minutes. Transfer the salmon to a platter and spoon the remaining glaze over (or you can serve it in a bowl, separately). This works well for the two of us or for a group – just increase or decrease how much salmon you use and adjust the proportion of sauce ingredients appropriately. Hope you enjoy it as much as we do! 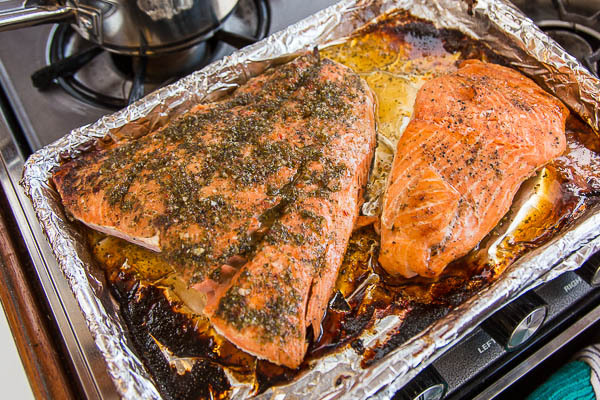 *For the grill, use heavy duty aluminum foil to construct one or more trays to hold the salmon. Spray with cooking spray. This entry was posted in Interesting by Kim. Bookmark the permalink.